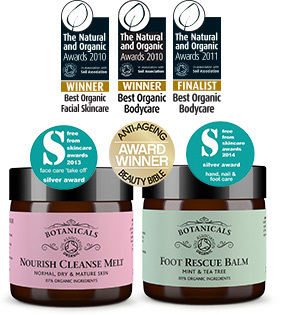 Two Botanicals 'hero' products - with our compliments! The 'try me' duo contains a sample-size 5g pot of each product, which will last for four to five applications. We have to restrict these to one set per customer, and we only charge for postage and packing at a reduced rate of just £1.95. We're sure you will enjoy them. But don't just take my word for it. Click either link to view recent reviews from our customers. And visit our blog for news of all our awards. But not before you've claimed your free gift by clicking on the 'More details' link below!